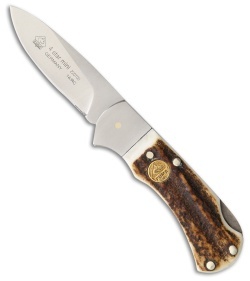 The Puma 4-Star Lockback Mini pocket knife is a small pocket friendly carry option. Made in Germany, the 440A stainless steel blade easily tackle your day-to-day cutting tasks. Naturally dropped stag scales are attractive and comfortable in hand. Polished nickel silver bolster with brass liners complete a sturdy reliable pocket knife.